What defines success for you? What kind of obstacles are in your way to a healthier, happier lifestyle? What are you looking to accomplish by working with us? These are just some of the questions that we’ll ask you at Personal Training Institute. Why do we want to know these things? Simple. Our goal is to help you reach your goals! For that reason, our staff is dedicated to knowing what you want to accomplish with us, whether you want to fit into those old pair of jeans, increase your strength as you get older, or feel younger and more energetic. We’ve helped hundreds of Fort Wayne residents reach these goals and more! 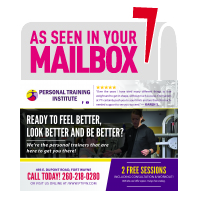 Here at Personal Training Institute, we provide personalized one-to-one fitness and nutrition programs for you to improve your health and lifestyle. We realize that fitness and nutrition both play a vital role in accomplishing any fitness related goal, which is why every program will include both fitness programming from our qualified Trainers and nutrition guidance from our experienced Nutritionist. This way you’ll get better results than you would with fitness or nutrition alone. At Personal Training Institute, our programs are meant to provide 3 key components to our clients: a support system, motivation, and instruction. We use these to help keep you on track and keep progressing week in and week out. One of the most important pieces to reaching your fitness goal is having a support system to keep you consistent and accountable to your goals. Well, Personal Training Institute is built to help give you that support. We will be here waiting on you at each scheduled training session, keep you accountable on your nutrition, and encourage you through the rough times of changing your lifestyle. In addition to our staff, you’ll also get the support of our other members. Even though all training is one-to-one, our members get to know each other while warming up or doing extra cardio. What better support than someone that’s trying to reach similar goals!? Another accountability tool that we utilize is a Members Only Facebook group to give you an extra resource for healthy recipes, weekly challenges, and a forum to reach out to other members or trainers. Ever go to the gym on your own and work through a couple reps, feel the muscle burn, and stop? It’s common and it’s hard for people to push to their limit by themselves. And yes, we feel the same way. But when you work with one of us in a one-to-one setting, we’re able to give our full attention to pushing you to your limits and then some. We don’t ever want you to feel like you’re not working hard at the end of a workout. We want you to improve from session to session. We’ll give you targets to shoot for on each exercise to get you there. Once that muscle burn starts to hit, you’ve always got a few more reps in you and that’s what we will get out of you! Once again, you’ve probably gone to the gym, do some cardio, look at the strength machines and think “I wish I knew how to do some of those.” Well our job as trainers is to teach you how to exercise! We will lead you through your personalized routine, giving you form cues on each exercise. We want to make sure that you’re utilizing the correct muscles and staying safe on each machine. This also holds true with our nutrition coaching. We want to show you the types of foods you should avoid and the ones you should be loading up on. That way, you’ll have the tools to keep it going when you feel confident you can continue on your own! At Personal Training Institute, we promise to guide, motivate, and support you towards a healthier lifestyle! We will provide the tools and resources for you to use. We will help to keep you accountable in utilizing them to achieve your goals. We can’t wait to work with you!